The Lee County Community Tennis Association (LCCTA) is a registered USTA Community Tennis Association affiliated with both the USTA and USTA Florida. The LCCTA is a 501(c)3, non profit corp, volunteer-based tennis organization. ...LCCTA Mission: Support Lee County Tennis! 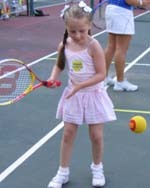 Our mission is to support or provide programs that Promote the Growth of Tennis in Lee County. The LCCTA and Lee County Parks and Recreation continue a successful partnership that develops and manages tennis programs at all Lee County public tennis courts. The LCCTA and Lee County Parks and Recreation continue a successful partnership that develops and manages tennis programs at all Lee County public tennis courts. For more information on the programs we offer contact us directly at executivedirector@lcctatennis.com or by calling 239-565-5300. Thank you for supporting Lee County Tennis! ...The Lee County Community Tennis Association is a 501(c)3 non profit corp.